This former Travelling College coach, was initially painted green on the Bluebell. return again to green. In May 2016 it was painted Carmine and Cream. Probably the most modern-looking carriage in the Bluebell collection, 4957 was nonetheless built over fifty years ago when steam locomotives were common on all regions of BR. M4957 was built with Commonwealth cast bogies and dual (steam and electric) heating for the LM Region. It spent most of its service life on the LMR, being based at Liverpool (Edge Hill) and Derby (Etches Park) in the early 1980's. By 1988 it had been transferred to Old Oak Common for Intercity special traffic work. In 1989 it (in company with 4941 and 5034) was in the Intercity Charter and Special Services "spare" (held for re-use) pool. 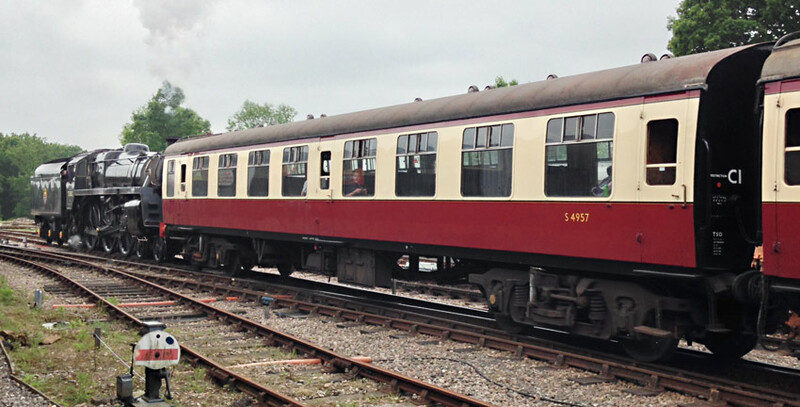 4957 was one of twelve carriages modified in 1989 to form the "Travelling College" train, which, it was intended, should carry parties of school-children around the country on educational tours. The venture was commercially unsuccessful, and the Bluebell subsequently bought all twelve vehicles. 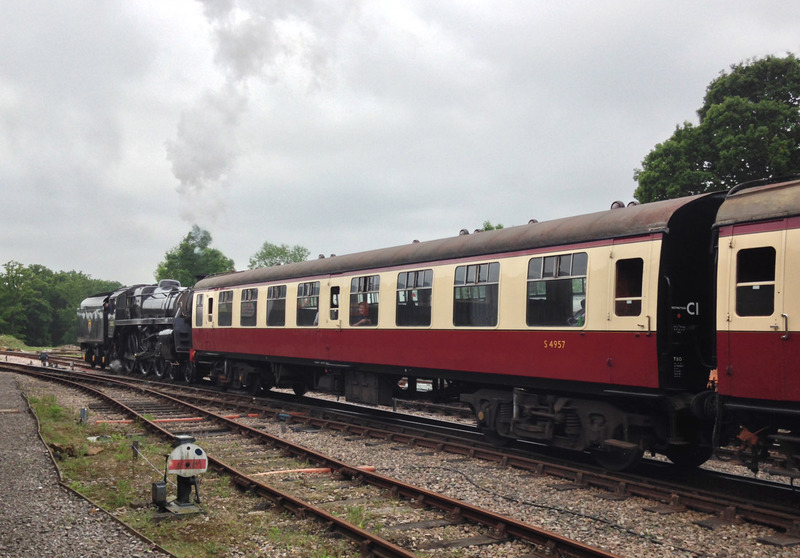 Three of the coaches, including this one, were used as lecture rooms, and whilst significantly altered from their BR condition, retained their seats. We were thus able to return them to traffic relatively easily. Although it was repainted in 1994, no major structural repairs were carried out at that time. Research suggests that three coaches from this lot were transferred to the Southern Region in October 1963. Two, including our own 5034, were quickly returned after diesel-hauled service on the Oxted Line, while one vehicle (5024 - now preserved on the West Somerset Railway) was retained. Its duties on the SR were generally Special Traffic (excursions etc.) on the South Western Division where, with wider seats, double-glazed aluminium-framed windows, laminate-faced panelling and fluorescent lighting, it would have appeared significantly more modern internally than those diagram 93 vehicles (like 4754) already in the SR fleet. On these duties it may well have been steam-hauled, although 5024 is known to have been part of Set 542, a 3-coach set working the recently-dieselised Reading - Redhill - Tonbridge service in 1965. 4957 received major structural repairs in 2003 and was programmed for a refurbishment in early 2015. However, the acquisition of the "more Southern looking" 4754 will enable us to sell on 4957 when 4754 enters traffic. See also the page for this coach's 2003 overhaul. *The designation TSO was adopted across BR from early 1967 to distinguish the 64-seat capacity 2+2 seating of coaches such as this one from the 48-seat SO, with 2+1 seating like 4824. The 48-seat vehicles were originally built only for the LM Region. From 1956 (when Third Class was re-designated Second) to 1967, both types had been designated SO. However, to confuse the issue, the Eastern Region had used the TSO code prior to 1967 to identify older diagram 93 BR 64-seat vehicles for excursion and secondary duties.